Investigators searching for skeletal remains in Vail this summer (David O. Williams photo). Parts of a human skeleton found at a Vail construction site and a waste disposal area in Edwards this summer are likely the remains of a man buried on a ranch in the late 1800s or early 1900s, according to the Eagle County Coroner’s Office. The discovery of the skeletal remains in June triggered frenzied media speculation that they might belong to Ted Bundy victim Julie Cunningham. Further investigation determined the remains were those of a Caucasian male. An investigation into human skeletal remains found in Vail and Edwards in June have led the Eagle County Coroner’s Office to determine the bones are most likely from ranch burial in the late 1800s or early 1900s. The skeleton was discovered on June 26 during the excavation of a construction site in Vail. The determination was made with the assistance of Dr. Melissa Conner and Dr. Douglas Scott of Grand Junction, based on artifacts found with the bones which included old wood, nails, glass and three ornate clasps which identified as coffin hardware. In addition, a black silk bowtie was recovered. Date ranges for the hardware design and style of bowtie span from 1880 to 1910. The remains are believed to be those of a white male approximately 5 feet 4 inches to 5 feet 5 inches tall, who was between 30 and 45 years old at the time of his death. The investigation began when a skull was discovered at a dirt collection site in Edwards. 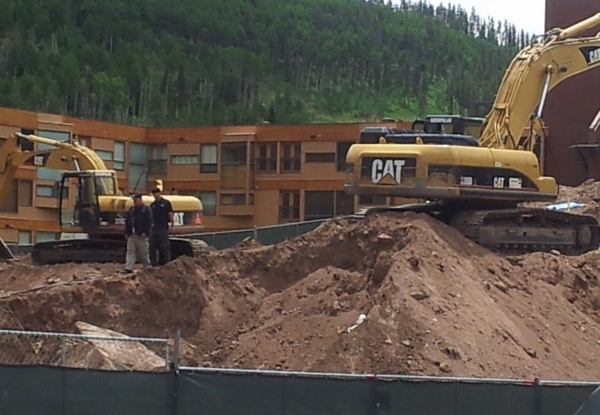 The material was traced back to the Lionshead Inn redevelopment project in Vail, where a femur was subsequently found. Over the following week, approximately 70 percent of the skeletal structure was recovered from the Edwards site. The original federal land deed for the property was held by Alford Larzelere, who owned the property from 1893 to sometime in 1902 or 1903. During his ownership, Alford Larzeler ranched the property and kept sheep and horses. There is no record of Alford Larzelere marrying or having children. An indenture document between Alford Larzalere and Caroline Bottolfson for $1,000 dated 1899 was filed with Eagle County in Red Cliff in 1902 by Rachel Bottolfson. An excerpt from the indenture document includes the following: “Alford Larzelere, only heir at law of Charles F. Larzelere, deceased.” No other records or references to Charles F. Larzelere have been located. Mentions of the Larzelere ranch and of interactions with the Bottolfson family were found in historical newspaper records. The Eagle County Times, which was based in Red Cliff from 1898 to 1906, noted the Bottolfsons as having stayed the winter on the Larzelere ranch in 1903. An excerpt from the same paper in 1904 indicates R. and C. Bottolfson had purchased the Larzelere ranch. An overlay of the Larzelere property using historical coordinates and a recent satellite image show the location where the bones were unearthed is near the southwest corner of the ranch. All of the Bottolfson family graves are accounted for in the Greenwood Cemetery in Red Cliff except for that of daughter-in-law Caroline Bottolfson, who is buried outside the valley. No death certificates or information on grave locations have been found for Alford or Charles Larzelere. Eagle County Coroner Kara Bettis says based on the age of the skeleton, history of the ranch and location of the bones, a reasonable theory is that the man was buried at the very corner of the original ranch – a common practice for the time period. Food wrappers found near the skeleton indicate the burial site could have been disturbed during construction in the 1970s and the coffin pushed to the edge of the current property boundary, which would account for the tumbled state of the remains when they were found in June. For now, the identity of the man remains undetermined. “Our investigation points to the strong possibility of the remains being those of either Alford or Charles Larzelere, however without additional evidence, we can’t say for certain,” Bettis said. The remains will be reinterred in Eagle County. Several agencies participated in the recovery and investigation effort, including the Vail Police Department, Colorado Bureau of Investigation, Colorado Fifth Judicial District Attorney’s Office and the Eagle County Sheriff’s Office. In addition, K-9 teams from law enforcement agencies in Denver and Elbert, Garfield and Jefferson counties assisted with site searches.